This series looks at the biology and behavior of the rainforest plants, animals and people, describing how they live together in harmony and balance and how vital they are to the well-being of the world. 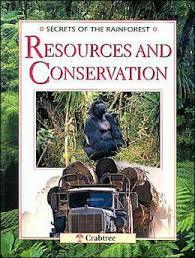 Resources and Conservation examines the eco-systems provided by the rain forests of the world, why forest clearance is taking place on such a large scale and how it is damaging the delicate environments. 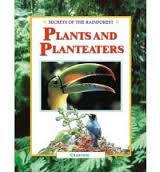 Divided into short, concise chapters it looks at the biology and behavior of rain forest plants and describes how they live together. There is an abundance of life in the rain forests of Africa, Southeast Asia, and the Amazon, though few humans live there. 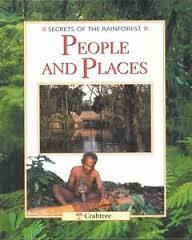 People and Places describes what and where the world's tropical rain forests are, how they are decreasing in size, and who the settlers, scientists, and indigenous peoples are who live in the rain forests. For many animals, danger lurks in every corner of the rainforest. 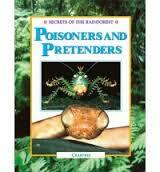 From brightly colored poison-dart frogs, whose poison is used by hunters to tip their arrows, to snakes and spiders with venomous fangs that inflict instant death, Poisoners and Pretenders shows how nature has provided many of these animals with bright warning colors and camouflaged skin to help protect them from other hungry animals. In its rainforest home, the sloth can spend its whole day chewing leaves and moving so rarely that plants actually grow on its fur. From giant trees with buttress roots to air plants that bloom suspended from trees, Plants and Planteaters describes the flowers, fruits and seeds of the rainforest that sustain this ecosystem's many fascinating insects, birds, monkeys and mammals. Nature ensures that new generations of animals are born to replace those that die in the rainforest. 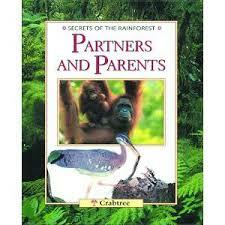 Partners and Parents features spectacular photos and illustrations along with clear, simple text that explains the elegant courtship rituals carried out by butterflies, birds, and mammals, why insects live together in huge colonies, how frogs grow up in tree-top nurseries, and how monkeys and apes like to troop through the forest in peaceful family groups.